These gigantic Kauri Pines are the largest of all of Kauri Pines. They grow in a very restricted altitude and climate zone. 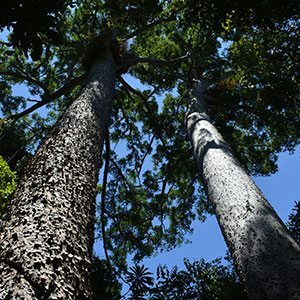 The best example that is easily accessible are the Twin Bull Kauri Pines at Lake Barrine in Crater Lakes National Park the Atherton Tablelands. Lake Barrine in itself is with visiting, a natural crater lake surrounded by forests. A series of boardwalks lead to the trees which makes access easy. These Bull Kauri Pines are over 50 metres in height and trunk 2.2 metres in diameter with a circumference of 6.5 metres. The crown is around 30 metres. They only grow at altitudes between 600 and 1000 metres, in deep fertile soils and in areas of high rainfall. 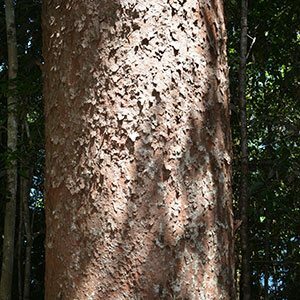 Characterised by a tall straight trunk with a flakey bark, the foliage at crown level is large and glossy. This provides shade at the base of the tree along with room for any seedlings to grow up into the light. Large cones are produced on mature specimens during summer and theses disperse seeds as they ripen and open. Take some time to stand beneath these trees and appreciate their presence. These amazing trees make a trip to the Crater lakes National Park worthwhile all in itself. Sheer beauty in ancient trees. Although they are not a tree for many home gardeners, they do remind us that nature is wonderful in many ways. preservation and conservation is important, and we are all responsible.